The Coopered Tot: Great King St. Artists Blend is a solid effort. Is it a Johnny Walker Black and Chivas killer? Great King St. Artists Blend is a solid effort. Is it a Johnny Walker Black and Chivas killer? Great King St.'s bottle is Edwardian elegance. When Compass Box turned ten they announced their intention to launch a new line of blended Scotch whiskies for the mainstream market. 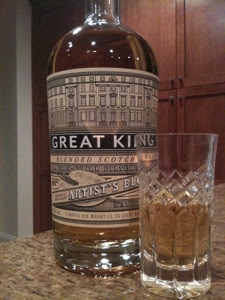 The initial product in this new "Great King St." line is the Artists Blend. 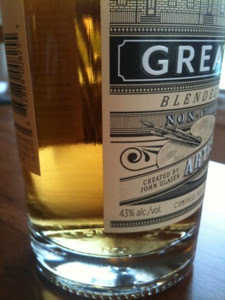 This inexpensive blended whisky is meant to appeal to first timers, people who don't normally drink Scotch, drinkers of mainstream blends, and anyone looking for an inexpensive easy drinking dram that has a bit more character than the mainstream usual blends (y'know, Johnny Walker, Chivas, Dewars, Passport, Ballantines, Teachers, Grants, Grouse, etc...). I'll weigh in, not only with tasting notes, but also with head to head tasting match ups with market leading blends Johnny Walker Black Label and Chivas Regal 12.
abv: 43% Price at Shopper's Vineyard $37. At Union Square Liquors $43. Nose: Green apple, lemon curd parfait, cake batter or raw pie shell dough, a yogurt or yeast note, and a hint of sherry. There's a bit of rawness in the uncooked bakery stuff that I don't love - but the lemony aspect is really nice. A lovely light gold color. Entry is sweet with soft baked fruits (apples / pears) but then a firm bright note pops up at the midpalate. Sprit heat, but also a bit of Spice Tree clove and nutmeg - but faint; more like just the tingle with little of the aromatics. There is also a note I recall from Hedonism: an acid almost like citrus, but without the tang which evolves into a touch of coconut and candy. It all rides on a firm grain body and a fairly rich mouth feel - almost creamy. At the turn to the finish there is the lemon parfait note again. It arrives with a suggestion of sherry sweetness that communicates "Scotch" to me. The finish is moderately long. It has an oaky quality, but fades to a slightly bitter finish that doesn't fit well with the rest of the presentation. It's a complex flavor profile, but a soft and gentle presentation overall. My subjective impression is good. It's interesting and pleasant to drink. The complexity is clearly emerging for all that barrel management and blending. There is oak, there is some spice from the quercus petraea spice oak. There is the whiff of sherry. There's a lot going on for a light and sweet dram. This could hold your interest. So, how does GKSAB fare against Johnny Walker Black Label (JWBL) head to head? First of all, I'll admit that I'm rooting for Compass Box. It's a young iconoclastic artisanal company that has a clear way with grain whisky (look at their Hedonism offering). Johnny Walker is a staid old guard that has sold this flavor profile for a century (could it be coasting?) and makes a fairly nasty lower blend (Red Label). Red Label shows me that Diageo doesn't have that way with grain whisky. Costs are close: GKSAB is $37 and JWBL is $34 at Shopper's Vineyard. This is close enough to not be a factor, but Johnny is a little cheaper. Color: GKSAB pale gold. JWBL rich dark gold - granted JWBL uses caramel color and GKSAB specifically states that it uses no colorings and is not chill filtered. Nose: GKSAB: Lemon yogurt parfait and buttery cake batter and faint sherry. JWBL: Malt toffee, hint of peat, clear sherry note. Flavor: GKSAB is distinctive and has complexity, but the slight thinness in the body and slight bitter note on the finish do not compare well head to head with JWBL which has a slightly thicker mouth feel and a firmer malt body through the midpalate and a more lingering wooded and graceful finish. JWBL feels denser and tastes like it has a higher proportion of malt. (I'm not saying that it actually has a higher percentage of malt - just that it tastes like it does). It has a sophisticated balance that comes off as more mature. Part of this might be the peat and bit of smoke in the JWBL flavor profile. GKSAB feels a bit younger and thinner and more grainy. So, JWBL wins hands down on price, density, and on hitting the archetypical "Scotch" flavor profile. GKSAB succeeds in being soft, sweet, original, and different. The difference doesn't serve as a better introduction to the segment in my opinion. I have no problem recommending both - but Johnny Walker Black retains its place as the mainstream default pick in my opinion. This reminds me of a survey of the ketchup market I read a few years back. Interesting new artesanal ketchups didn't beat boring old Heinz because Heinz nailed the center of the ketchup flavor profile everyone expects and loves. JWBL just nails the archetype of the Highland Scotch flavor profile. GKSAB is something totally new. It's really not a straightforward comparison at all. 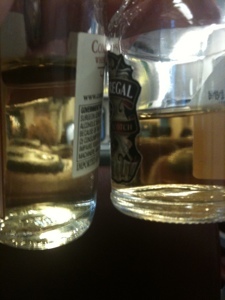 How about head to head against Chivas Regal 12? Here GKSAB is the clear winner. Chivas is slightly richer in color, but has the thinner nose and less richness on the palate. Chivas' mild sweet nose is too simple by comparison with GKSAB, there is less going on. The cake batter note in Chivas puts the flavor profile in the same light sweet doughy region as GKSAB, but with less flavor density, complexity, and heft. GKSAB has far more interest and complexity, as well as better flavor density, more grain body, and a longer, more interesting finish. So, in the context of the both Johnny Walker and Chivas we see Great King St. slot squarely into the pack - but clearly very close to leading. But the uniqueness of its flavor profile and it's elegant poise makes it a compelling pick. The lightness and softness of Great King St. is part of the family trait of Compass Box - but it works better with the floral lightness and body-tautness of, say, Asyla than it does here. I applaud the Artist's Blend for the many things it does right - but I want more heft in the middle and a bit more oak in the finish. Still, I can't help feeling that these are quibbles. Great King St. Artist's blend is on my short list of recommended blended Scotches for new Scotch drinkers. "Artist's Blend is soft and full on the palate"
Update 4/5/12: Two weeks later I find I'm enjoying Artist's Blend even more with time. The brightness and firmness hold up to repeated drinking. It's a new flavor profile - but with familiarity comes affection. Great King St. Artist's Blend is working for me. Great post, Josh! Thank you for being upfront with that fact that you are rooting for Compass Box (I am too, and am beginning to loathe Diageo), but then going ahead and being honest about the comparison. This really helped me put Great King St. in context. Most other reviews I've read just stop at the praise, making it sound outlandishly good. I do agree that great companies like Compass Box deserve a bit of extra consideration simply for doing things the right way. Sometimes that extra bit can make up for being a little behind in the flavor department, sometimes not. Having recently tasted most of the Compass Box line I can state that Great King St. is the lowest cost item for a reason. It's the weakest, ultimately. However there's something very unique and distinctive about it. I can see some people seriously loving it. I'm just not one of them. It's too easy to spend $5 more for Asyla (or a number of other light and sweet non-blended options). Nonetheless I hope Compass Box keeps up with their outstanding and innovative efforts. Fantastic post, and a great idea with the JWBL comparison. I think your viewpoint on Compass Box vs. Diageo is far from controversial. People will always root for new, different, well-made whisky. I have an open bottle of the Asyla at home (as well as one of the JWBL). They are just very different whiskies. Both tasty in their own ways. But between the $7-$8 price difference and the pleasing wood and gentle peat, I'd be much more inclined to re-purchase JWBL in the future, despite my bias toward the underdog. And yes, your analogy to the ketchup study (that I read about in a Malcolm Gladwell piece) is spot on. JWBL just scratches a certain itch. It is the one whisky where I pour myself a glass, and ten minutes later I notice that the glass is empty. Whoops. Brilliant, WhiskeyWriter. So glad to meet you. I've read your blog for months and it's been on my blogroll most of the time Coopered Tot has been in existence. Love your writing. "In a world where malt whiskies get all the attention, people often overlook the pleasures of good Blended Scotch Whisky. We believe it is time for the world to take a fresh look at this style, and that is why we have created Great King Street. More than just a new brand, Great King Street is a mission, a mission dedicated to reviving interest in one style of whisky only: Blended Scotch Whisky." Meanwhile, vast numbers of people drink mainstream blends - far more than drink single malts. 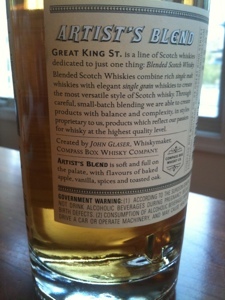 If Great King St. is "reviving" blends - it calls out for a comparison with the king of the blends. 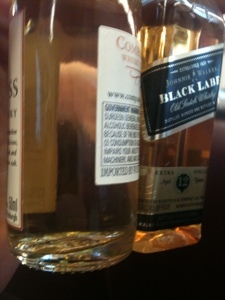 Thus the comparison with Johnny Walker Black. As for Asyla - it's a lighter more floral blend. I slightly prefer it to GKSAB, because of the floral nose and up front sweetness and less of a bitter note at the finish. Bottom line - in the domain of blends, I think I might prefer JWBL over all. Meanwhile I actually own a bottle of Great King St. and only buy miniatures of Johnny Walker black for these comparisons. Maybe that says something. This is one of the reasons I'm really fond of Isle of Skye 8 Year. It's a cheap-ish blend (~$30), but the contrast between the peaty Talisker single malt and the smoother Highland single malts and grain whisky make for a really engaging experience. It's obviously not going to be as good as a really solid single malt, but I'd say it's better than a lot of the lower end single malts (I'm looking at you, Glenfiddich 12 Year). I'm really looking forward to trying the 12 year old version of the Isle of Skye blend, because a bit more depth would really push it into incredible territory. I've put your blog "Chemistry of the Cocktail" on my blogroll. It's very interesting and provides an interesting new perspective with lots of cocktails, whisky reviews, and new uses for whisky (for me). Thanks for dropping by and teaching me a bunch of things. Isle of Skye is a bit of an odd beast because the flavors initially don't seem to integrated. But I've found that after a decent amount of time in the glass they come together in a more pleasant fashion. It's not quite up to good single malt standards, but I'd say that it's a better than a lot of the lower end single malts (Glenfiddich, etc.). I'd say that it has some similarities to Talisker Distillery Edition in that there's both smoke and sherry, but the flavors are obviously much more subdued than that single malt. Thanks for the add, Josh. I'd been an odd path through cocktails to neat spirits, but it's nice to have both available depending on my mood. You've been blogging a long time, Jordan. You have a ton of material up. I'll be reading for a while. I'll be looking for a good cocktail that uses Great King St. (I have a bottle just sitting there). I'm unlikely to buy Isle of Skye because I have so much single malt to get through. However I'll look to try it in a bar or sample as part of the "value equation" analysis. Another Islay bargain I'll be looking to try in that area is Finlaggen. Have you tried that? It's a less expensive younger Islay rebottling.